by The News Publishing Company, Inc. 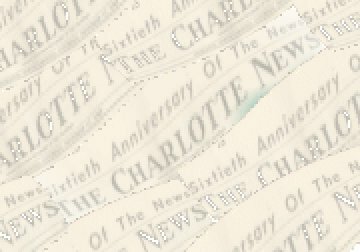 The daily edition of The Charlotte News was established in 1888. The Sunday edition was added in 1910. The Evening Chronicle, established in 1903, was purchased by and consolidated with The Charlotte News May 8, 1914. We seek truth that we may follow it. Articles in the drop-down menus are arranged chronologically only. (The second box contains sixteen complete editorial columns with 76 Cash editorials, including 11 Moving Row columns; the third box contains 287 editorials, and the fourth box, 150 book-page articles and editorials; scroll down the list until you reach the chosen article, click so that the title appears in the box, then mouse-over the "NEWS" whirler.) All articles of the same date in the "unsigned editorials" list may be accessed by hitting only one of the articles of that date and then scrolling on the linked page. (If another article than the one chosen pops up, but of the same date, scroll up or down the linked page and the chosen article will appear.) When using the drop-down menus, remember to use your back arrow on the browser or, better, the "IE" link above on the navigation bar rather than the link at the bottom of each article as that link will take you to the News links page. ===========MOVING ROW COLUMNS FROM THE NEWS--1928========== I Propose A Lodge--March 4, 1928 I Am Against Companionate Marriage--March 11, 1928 Who Nurtures War?--March 18, 1928 What Constitutes Decency?--March 25, 1928 "On a morning..."--April 8, 1928-Remembrance of things past...and future.